When the US says Navalny, Russia should say Pinkney! Judge Sterling Schrock sentenced the leader of the Black Autonomy Network Community Organization (BANCO), Rev. Edward Pinkney, to 30-120 months in prison based on an all-white jury’s verdict of guilty on five felony counts of forgery. The charges stemmed from a successful recall petition drive against Benton Harbor Mayor James Hightower, who is perceived as a tool of the Whirlpool Corp. and the political power structure in the area. The judge explained in court, according to ABC News, that Mayor Hightower had suffered psychological distress following the recall. The judge said the mayor’s distress played a role in his sentencing decision. 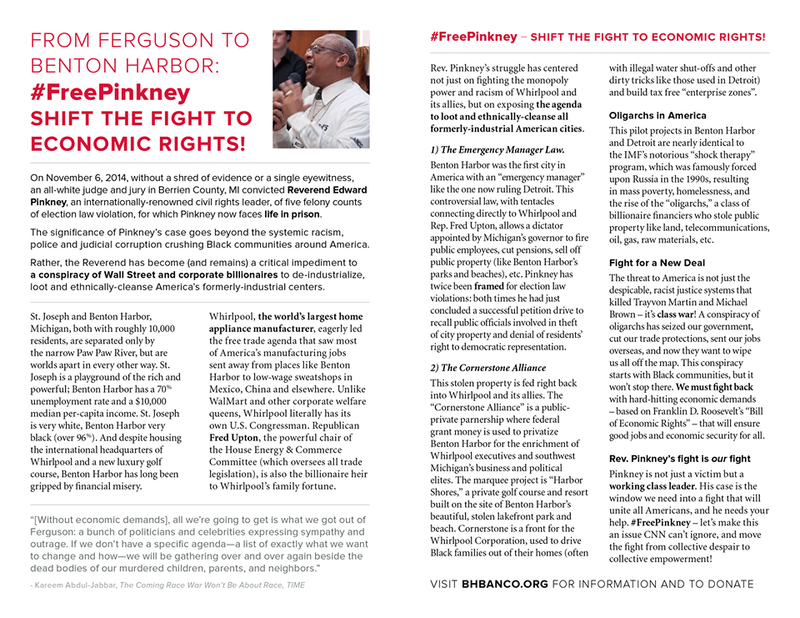 Pinkney has been a longtime activist in Berrien County, where Benton Harbor is located, and his work in the state of Michigan has drawn national attention. This is the second time in seven years that the BANCO leader has been convicted on charges related to efforts to hold local officials accountable to the people. Activists present from various cities were outraged at what they perceived as a total travesty of justice carried out by the local courts. They pointed out that police who have been videotaped killing African Americans were allowed to go free, while Pinkney had been convicted and sentenced to prison without any material evidence. During the prosecution’s presentation of its case against Pinkney during Octobert and November, there was no eyewitness testimony that would implicate the Berrien County activist in the alleged crimes committed. Even though the prosecutor and judge said the evidence was circumstantial, there were no clear cut motivations articulated which would place Pinkney in a position to change the dates on the recall petitions. He later turned to prosecutor Sepic, pointing at him, saying, “You know I did not do anything illegal.” Prior to sentencing, Judge Schrock lectured Rev. Pinkney, saying that his sentencing is designed to send a message. Written by Nick Chiles, Editor-in-Chief of AtlantaBlackStar, a Pulitzer Prize-winning journalist and New York Times bestselling author. He has written or co-written 13 books and won over a dozen major journalism awards. This entry was posted in Uncategorized on January 5, 2015 by bperet. Well done! As I see it, the US has precisely zero moral high-ground from which to criticize anyone for anything; just about every heinous act conceivable has been committed by one or another facet of the US government. We citizens are also complicit (this includes yours truly) for our tacit assent and/or active collaboration by continuing to allow such a hideous regime to stay in power and spread its freedom and democracy on the unfortunate rest of the world. I have the impression that the rest of the world, including the industrialized, semi-willing US “allies”, are waking up to this; more important, their populations are becoming increasingly and painfully aware of just how beneficial being a US “ally” is to them, on both the personal and societal levels. Please spread the Pinkney story around. The guy’s sitting in jail and the whole case is a total frame-up! You’ll find him all over YouTube – a very positive man, not at all divisive like other so-called civil rights leaders, eg. the FBI agent Sharpton. Have posted this everywhere I can. I don’t at present have enough knowledge to get especially excited about the Pinkney situation–at this point, to me, it’s just one more instance of gross injustice in the US, of which there are many. I will need to look into it further before emphasizing it more. Re Sharpton: FBI agent? He’s been a sell-out to a large degree and for some time, he has a checkered past; but this is the first I’ve heard of his alleged complicity with the FBI. Although I don’t consider the veracity of this assertion a matter of particular importance–compared to other, more pressing and more catastrophic concerns–I am open to being enlightened on this, if you think it worth the effort.